Have you had dreams about The Cure? 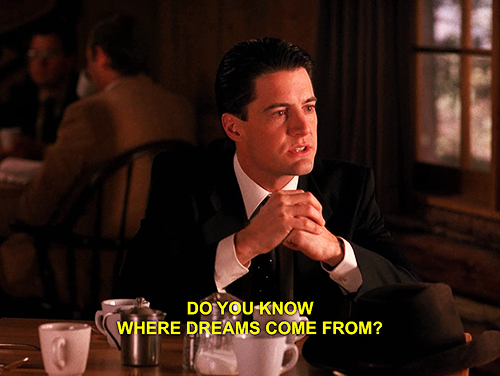 Re: Have you had dreams about The Cure? Well I've never been a big MM fan, but there used to be one song I kinda liked, I've forgotten the title though. I'd accept him if he wanted to join us for a Curefan meeting. Ha ha, thanks for taking me along!! I hope I'll get to see The Cure again one day soon, maybe even with you and David and more Curefans! Hahaha that’s good to know, should I ever turn up somewhere with MM in tow Oh the things your mind does to you when you sleep. I read somewhere that dreams help us to live with trauma, by dreaming about it, we are reliving it and it’s supposed to help it us accept it so we can move on from it in real life. Awww you’re very welcome. I was pleased to see you and I really do hope that it will become a reality at some point Until then, the dreams will just have to do. Sounds fun, Chemicaloverload! Although the truth is that I will never ever listen to more than one word or chord of a Marilyn Manson song. I had a dream as well. It was one I've had before, at least in the same location. It was in a smallish amphitheater with red seats. I recognized a smiling guy who was collecting little pieces of paper from audience members. The Cure was taking a while to come out. Then some people from behind the scenes came and rearranged the audience. I moved from where I was sitting to very close to the front row. Robert Smith came out for like half a minute, as if doing a sound check or something, looked at the audience, but then disappeared quickly. Then some performers came out on stage to do an advertisement and the audience was told to respond in a way to show viewers at home that we were into what we were watching. There were even paid audience members brought in, wearing business clothing. I had the sense that The Cure didn't approve of using the fans to do this and hadn't fully given approval. Then the advertisement was over, the stage was cleared and the audience went back to normal. The Cure had not come out by the time I woke up. Awww you woke up before the best bit! I like that idea, live advertisements, how weird would that be to watch in real life? I wrote all that while I was blurry eyed this morning, wanting to jot it out before I had to run out the door. "I like that idea, live advertisements, how weird would that be to watch in real life?" It was as if the people producing The Cure show were using Cure fans to experiment on or for other purposes unrelated to The Cure. Kind of like when you give your email out for one purpose and it's sold to a bunch of vendors. It was as if the ticket agency was using Cure fans to promote outside interests or something. Anyway, I got the feeling that The Cure and/or Robert Smith didn't approve of Cure fans being used like that, maybe didn't have the guts to speak up against it or maybe didn't know that the audience would be used for outside purposes. I have been dreaming about The Cure for so many years! I didn't pay attention to most of my dreams about them until a couple years ago. One of the most interesting was when I dreamt last year that they were going to be playing in Orange (that's the county in California where I live, Orange County) and the next morning I woke up and had an email from my sister that The Cure in Orange was going to be playing in Hollywood with Lol Tolhurst giving a Q&A. I know not all of my Cure dreams are prescient, but some of them are. This video made it to 100,000 views today! I had no idea these little rusty videos would make a dent, but I'm grateful. <3 Hope you like it. I'll see you all in my dreams, if not for real. Awww, Twin Peaks. Dreams seem to be a mixture of meaninglessness and meaningfulness. I guess it depends what state of mind we're in when we're having the dreams. Taking a b-12 tablet sublingually before bedtime can enrich the dream life. B-12 helps improve our mood, memory, and feelings, so maybe it helps us to feel clearer as we dream and also remember dreams better. Awww, Twin Peaks. Dreams seem to be a mixture of meaninglessness and meaningfulness. Yes, I have the same impression. Last night I dreamt that I was with Robert Smith and handed him two small cards and asked him to autograph them for me. When he handed them back I noticed he'd written three telephone numbers on the cards. I think the area codes were (703) on all three numbers. (I just looked up 703 and it took me to Virginia in the USA. Then I googled 703 England and guess where it took me to? 703 England Street in Ashland, Virginia! So let's watch and see if there is any Cure activity in that region). In the dream I called one of the numbers and it was a radio station. The man who answered the phone gave me a number to reach Robert, I think...The other two numbers on the cards seemed like they were just leads, so I called the number the radio guy gave me and Perry Bamonte answered. I wondered why Robert was directing me to Perry. As I talked to Perry we set up meeting after the sound check of a Cure concert, at 10 PM at night, an hour before the show was to start at 11 PM. I had a Robert dream last night. He came up to me at a show and said something about my make-up. I was hardly wearing any, and I don't remember what he said about it, but I got a lot of footage of The Cure performing and was really excited to make videos out of it to share with other Cure fans. Then I realized I hadn't started working on editing the footage and it was already a day after the show and I was worried that it wouldn't get seen. (I noticed after going to Cure shows and uploading videos that it gets more views if uploaded as soon as possible rather than later, as if most fans only search for a couple days after a big show, so maybe I was just processing some delayed anxiety about that from past shows). It was really nice to dream about Robert, always good to wake up knowing I've dreamt about him and The Cure. For me The Cure is like water, really magical and inspiring, especially beneath the surface. I sing a song to myself and I'm in Cureland. Today I was singing "between you and me" from Bloodflowers, absorbing the sweet feeling of anything being between me and Robert Smith. It's sometimes a dilemma to be so in love with my soulmate but to also have a deep crush on Robert Smith. I wonder, what if Robert took me out on a date? How would I explain that to my significant other? And would one date be enough? Oh yeah, and then there's Mary...Ha ha ha. We loyal, faithful people only fantasize about cheating on our spouses/lovers/partners and even feel guilty for just imagining! I feel this faith that someday I'll meet Bob, but most likely it will be when I'm not expecting it. Does anybody else hear Cure songs almost everywhere they go? This happens so often. I walk into a cafe and Just Like Heaven starts to play, or Lovesong or Boys Don't Cry or Friday I'm in Love. It happened when I was visiting the White Cliffs of Dover, just a couple days after the Anniversary show in Hyde Park. I walked into a grocery store to buy some crackers and Just Like Heaven started to play. Here in California, too, so often that it feels very special. Picture is from a recent swim. I love to take pictures underwater with a dress on. - Swami Prabhavananda and Christopher Isherwood, 1953, from a book in which they were discussing the yoga aphorisms of Patanjali. Thats a beautiful photo Tanya, the water looks so clear and blue! Reading both yours and WOAW words today is making me feel quite emotional. Very timely, Word on A Wing! I just watched a couple videos on Karl Jung and the archetypes, shadow, anima/animus last night. And I've been practicing yoga for 20 years, so resonate with the words you've quoted and your after thoughts. I discovered a few years ago that Robert Smith is my animus. My godfather, who I loved dearly as a child, is also named Bob, is also a Taurus like RS and also played guitar in a band and sang. When I was 14 years old I fell in love with Robert Smith and devoted my life to him and The Cure as much as I could for where I was in life and the resources I had. The devotion manifested itself as an onslaught of posters, collages, collections, t-shirts, stickers, magazines, gothic clothes, and even intense arguments with my mom who fought with me to go to bed if a RS/Cure interview was on the radio too late at night. I dreamed of marrying Robert, even though I did have pictures of Mary on my wall, too. :-) My mom told me that I was just looking for a father replacement to the less than satisfactory father I had, which stung and hurt to hear. Still, it was at 14 that Robert and Mary met, as I had read in interviews, so I knew that real love feelings could exist at that age. By the time I was out of High School, (1997) I let go of the obsession, giving away almost everything I had collected to a co-worker's girlfriend who was mildly interested in The Cure. I think I was trying to give her my obsession so that I could pursue a healthier lifestyle. I got into running, practicing yoga, a vegan, plant-based diet, and started going to the beach again. I started dating, and believe it or not had my first serious relationship with a Taurus Englishman named Paul whom I had met at the bookstore we both worked at. He was from Essex and very ingrained in the British culture, drinking tea several times a day and taught me British words and customs. By then I'd only go back and listen to The Cure on occasion, but didn't get back into them fully until 2015. And since then I've felt devoted again, but not obsessed anymore, just "love" as you say. Love. Here's another focus of my love, my baby nephew who I call "Boop." And my soulmate who travels with me to Cure shows. I had a dream that I snuck Robert into a Criminal Law lecture I was teaching about the ins and outs of murder?!? And I sat him right down the front so no-one would notice him?? Prior to the lecture I was showing him around the old college building commenting on how it reminded me of a old asylum with its green tiles and winding stairs. Jesus; the word thats on the tip of everyone’s bullet. I don’t know how I missed this earlier, great dream. So he’s sitting listening and looking up at you as you communicate to the room ... role reversal ?